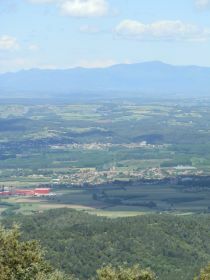 The best viewpoint across the Costa Brava is from the Santuari dels Angels above Madremanya. 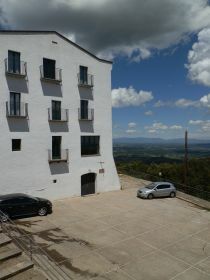 Els Angels is a monastery (but with cafe and viewing terrace), situated at the second highest point on the Gavarres (488m high) with huge views in an arc of about 270 degrees, from Montseny, across Girona, the mountains of the Pyrenees, out to Banyoles, across to Figueres, the sea from Roses and then around to Torroella Montgri around just about to Begur and the bay of Pals. The road up to the Santuari is very popular with road cyclists as a challenging hill climb and is used as a training climb by professionals (apparently including Lance Armstrong when he was based in Girona). 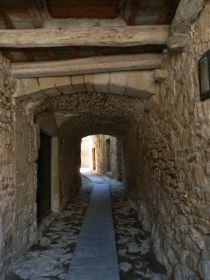 This is a long walk (close to 5 hours) as we stretched the route to make a round walk via Sant Marti Vell. 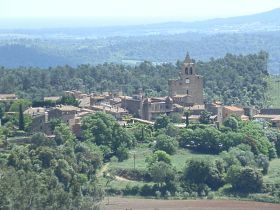 Though the village of Sant Marti is very pretty, the walk down from Els Angels is mostly a track through the woods with only trees to see, so for a shorter walk consider a more direct route back to Madremanya. The paths also run off the edge of the walking map we use (Emporda Costa Brava 1:30,000) - we don't know of a good walking map for the area around Girona - so it is difficult to plan alternative routes (update 2014: we've now found an ICC walking map for Girona area including the Gavarres). The walks are very clearly marked from Els Angels down. The markings (yellow and white) for the path up have faded/disappeared in some places. 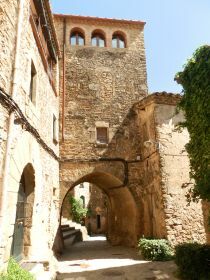 We start in Madremanya, a small medieval town with very thick town walls and arches at the foot of the road up to Els Angels. We decide to start into the hills and leave looking around the town until later and head out of town past a couple of garden restaurants (missing the signposted walk) on the road and then down, across the main road and along through the hamlet of Vilars - a collection of 4-5 renovated farmhouses. As the road passes the last house it switches to a dirt track which climbs gently into the hills through the woods. As the path climbs, we have views back down the valley towards Madremanya and the higher we go the further we can see, with views of the sea behind the village. As we reach the limits of our map, the path divides. We're trying to follow a yellow-white marked path, but find we have to look very carefully to find the markings. At the divide it looks as if the path continues straight on, but we spot the cross and follow the track to the right as is snakes around the curves of the hill. We were expecting to still be going up, but this is relatively flat, though with fabulous views out across the Empordan plain to the sea. We're slightly worried that we've taken the wrong path as it doesn't seem to go up, and we can see the hillside above us, but eventually we reach a junction, and the first proper signpost. We follow the direction to the Santuari dels Angels and path quickly turns up and starts to climb more quickly running across a ridge. We are on Itinery 1 and as we go up, the path seems to steepen with quite an energetic climb through the woods. Eventually we reach a junction which meets the Itinery 2 path (the way down) and we make the final climb up to the Santuari past the picnic tables (it's very popular in summer), and up to the main building itself. 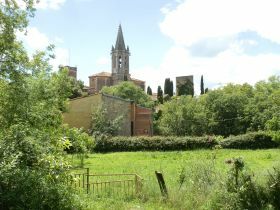 The Santuari has a cafe and restaurant in addition to the church and main religious building. There is a viewing path and if you walk around the centre you can see for more than 50km in all directions. There are also a handful of cyclists who have stopped for a breather before taking the route down. A range of cycling plaques and medallions can be seen on the walls. After taking a pause to take in the view, we head back to the Itinery crossroads and start to follow Itinery 2 out towards Sant Marti Vell. It's a gentle slope down and to start there are views, but after a while the path dips into a wooded valley past a chestnut grove and the views are replaced by the sheltered isolation of the trees and the valley. Wooded paths are pleasant, but not good for pictures. After a while we emerge from the woods past some small vineyards and isolated farmhouses along the edge of a stream, and eventually reach Sant Marti Vell. Sant Marti Vell is a very small ancient village, but with what looks to be a well-adorned church, almost in an English style, with a steeple. We sit for a while enjoying the sun playing on the golden stoned buildings on the long stone bench that runs around the Placa Major. 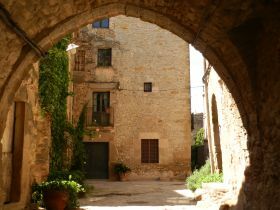 Sant Marti has a maze of narrow little streets and we follow them down emerging at the bottom of the village by a small stream. 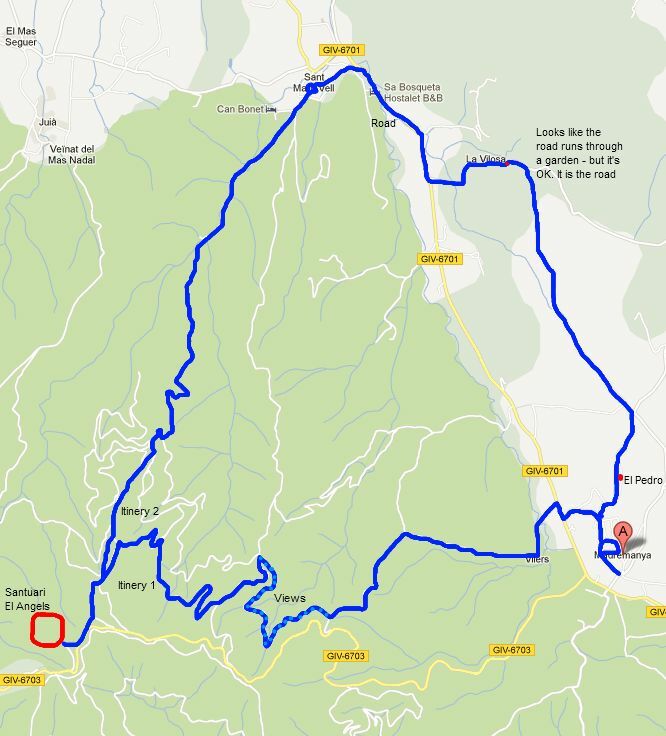 The easiest route is to follow the road back to Madremanya, but it's actually quite a fast and modern road recently updated so instead we follow the road for a while, then turn into the neighbourhood of La Vilosa in order to take a more leisurely route. At the top of the hills to the right we can see the white building of the santuari up above us in the distance. La Vilosa is another hamlet of large old houses with big gardens. There seems to be the constant smell of roses as we walk through. At the end, the road switched back to a track, but it's so prettily done that it looks as if we're about to enter someone garden and we ask the owner of the house if it's the right route. It is and we carry on. The path leaves the gardens and we turn right onto a track just past a farmhouse, and head out past fields of wheat and poppies. This is the area we walked from Pubol with the firedamaged woods on the side of the hill and we can see the path we walked then from this track. 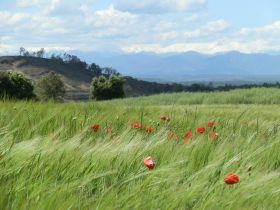 We're now pretty much walking through open countryside, but when we turn and look behind us we can see the Pyrenees still capped with snow. The heat of the day has lifted the cloud making it almost an alpine type scene. We're drawn on by the sound of a Cuckoo and the summer red of the poppies in the field contrast with the cold white on the mountains. The path meets up with a road and we have the option of following the road, or turning and taking the path up to a group of houses on the hill. We take the path and pass along what seems to be an isolated single street of stone houses perched on a ridge. This is El Pedro and it looks almost like a scene from the Cotswolds. A few hundred metres further on we reach Madremanya and enter the town through an old town gate, passing under two long arches. From the width of the arches, the town walls seem very thick. Ahead of us is the Placa Major and the church. Churches always seem to be squeezed in among the houses and Madremanya is no exception - the church sitting pressed in on all sides by narrow streets and medieval terraced houses. All the streets seem to pass through archways that would have been part of the town wall. It's all very well preserved and restored. We find our way out and walk back to the car. In the garden of the town hotel, a great arbour of roses is perfuming the air.